Four-Stroke power for model boats??? Read this to learm more about this interesting concept! 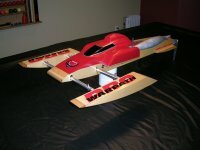 Four Strokes in RC Gas Boating? In this multi part series devoted to the theory of thumpers in an RC boat, we'll go hand in hand through a process of finding out, just what the possibilities might be. The idea seems natural, that economical, environmentally friendly, good for the air, good for the ears four strokes would be a possible fit in our hobby. There have been some recent product releases that are leading the way in miniature four-stroke development and technology advances. In our series we will be working with one that shows some promise and fits our criteria quite well. Looking at what is available on the market and having some predetermined requirements, the Honda GX series was chosen for this project for several reasons. The Honda differs in that the engine contains the oil and all you add is gas. Some models out there still require a pre-mix which defeats a portion of the "environmentally friendly" requirement. These are a few of our initial concerns and feel free to write the editors with any thoughts you may have. This series will be interactive in that we will look at the reader mail and do our best to incorporate those comments and questions throughout the adventure! And this is an adventure! We welcome your participation. "Too heavy, not enough power"
"Water in the oil, instant death"
"Too expensive to make modifications, cams are tricky"
"Will never be fast enough"
Some of what was said is exactly correct and warranted but not inherent flaws, only opportunities. "Those who say it can't be done should make way for those who are doing it"
So, there's the groundwork, we have an idea, we have the pieces and now the journey. Secondary Objective: Make it go fast and live! There is a small group of people who have been working on this project for quite some time. Development has went a great distance and is ongoing almost daily by a few dedicated and talented individuals who have the tools and technological skills to correctly adapt to new thinking and thorough process of development. We're not going to let the cat out of the bag right off from the start, but let me say, it is working. Let's look at the Honda GX31. It displaces 31cc of course, is an overhead valve design, has a pressurized oil mist circulation oiling system, which has an oil tank complete with dipstick! The engine is well engineered and built with strong parts and a strong design. You can find all the technical information and specifications here (Honda power link). Power is rated at 1.5 hp with a max operating rpm range of 10,000 (It will rev higher). The RPM range is the first thing to come into question, it's kind of low when we compare to our Zenoah mainstay which is capable of 17,000 plus in maxed out race motors, but generally operate in the 12,000-15,000 range. This is no lightweight but it's not a tank as it appears from pictures. We are still working on putting this thing on a diet so no true bottom line weight has been established as of yet, but significant weight can be saved...more about that later. Even in full dress as it comes out of the box with it stock peripherals, weight doesn't seem to be a problem. Another thought may be the higher center of balance from all the goodies up high on the head, but again, it doesn't seem to be an issue. It has most of its weight down low. Here is a comparison to a Zenoah PUM motor. It appears to be quite large, but most of the bulk is shrouding and stylistic parts. It is not much larger than a full dress Homelite 30cc. It has a wider footprint than anything else that's been put in a boat due to the oil tank. This is a major concern, and how to deal with it efficiently and effortlessly. There is only one way for water into the oil and that is through a breather tube that attaches to the air box. Some creativity is required in this area and some developments are ongoing. Contrary to what some may believe, it does not mean instant death if you have to dump out milky oil once in a while. Running it when you KNOW there is water in the oil will kill it. It's going to happen but the goal is to minimize the possibilities. Those two requirements are exactly why the Honda was chosen. When looking at the available candidates, there is no shortage of respect of the capabilities of a Honda product. Modifications, and is it fast enough for competition? The answer is~ we think so. When approaching this project it was my first concern because I race. It's the meat of the hobby for me personally. More to come in the next installment of FourStrokePower! I would see it in a big 57 incher that's weighed down to look and handle like a real boat. I have one sitting on a shelf here that I want to do something like this with...you know, make it heavy enough so it actually cuts through waves rather than bouncing on top of them... I want a real scale look and feel...don't care if it's just 40mph! Was thinking up putting a twin inline Zen in her, maybe a 4 stroke would be another option. Make a nice playboat for the cottage I am sure! My engine is turing pretty close to where a stock Zen turns with a canister, not as high but close. I am turning a huge prop on a surface drive. Once it gets moving the prop torque pretty much goes away, but taking off from a putt is quite interesting. This engine out torques a zen by a lot, but less hp- in the end, it's about how many rpm can you turn what pitch prop. Even heavily modded, it still would loose to a stock zen every time heads up. It's only advantage is, it could probably do the same speed with 5 more pounds of boat if I can think of any simple way to explain it. This wall is why they are for sport/play boating for now. 4-strokes do however benefit from much higher torque than 2 strokes...problem is that would mean the need for bigger props and that just doesn't seem to work as well in our applications. I could however see a possibility of using more efficient sub surface props with the 4 strokes...only way we will know is if someone actually has the time and resources to effectively test. I know I don't! I can't imagine a 26cc four stroke that would come close to the power of a 26cc two stroke. It would take supercharging, and piston superchargers would probably be the only ones that could generate the pressure needed with the small volume. YS has built crankcase supercharged four stroke engines, but they don't approach the power of modified Zenoahs. The maximum rpm for a YS 28cc engine is listed as 10,000, 1/2 that of a good Zenoah. It would take an overhead cam design to improve the rpm. Even with equal rpm, the four stroke would need twice the cylinder pressures. None of this is easy in small engines. I ran the Honda Cracker a week ago and for the first time ever blew it off the water. I thought it was a fluke, so I did it several times, made adjustments and still did it. I'd say that's running well enough. New engine development and props have gained some speed. I think Scotts comment is also a little over the top. The guy behind the development is still working on all kinds of projects including the 4 strokes. There's no sense in sharing technology and data on something that is no where near mainstream. No one likes to be criticized for trying new things, that's why it continues below the radar. There are actually a lot of Hondas in RC boats. I get questions all the time and pics sent to me from all over the world sharing thier 4 stroke projects. If we could rewind a few years, before a particular org vote that happened, you would have seen a lot of Hondas and other poppers at the race ponds, but a organized push to change the rules eliminated this possibility. This sealed the fate of four strokes in any racing situation for now.